Jan 5, 2014; Cincinnati, OH, USA; Cincinnati Bengals quarterback Andy Dalton (14) throws while being pressured by San Diego Chargers inside linebacker Donald Butler (56) during fourth quarter of the AFC wild card playoff football game at Paul Brown Stadium. CINCINNATI (AP) — Philip Rivers completed only a dozen passes all day, by far his season low. The Chargers knew they didn’t need their highly efficient quarterback to do anything dramatic for a playoff win. Just let the defense get to Andy Dalton and watch him unravel. San Diego put the pressure on Dalton in the second half and forced three turnovers that allowed the Chargers to pull away for a 27-10 victory on Sunday, extending the Bengals’ playoff drought to record levels. The Chargers (10-7) get a rematch with the Broncos in Denver next Sunday. They’ve split a pair of close games with the AFC’s top seed, losing 28-20 in San Diego on Nov. 10 and beating the Broncos 27-20 in Denver on Dec. 12. That win helped boost San Diego on its current five-game winning streak. "It’s going to be a great game," safety Eric Weddle said. "We held them to 28 points and 20 points. You never know." Fans of the Bengals (11-6) know what happens every time they reach the playoffs. They haven’t won in the postseason since the 1990 season, now tied for the sixth-longest stretch of futility in NFL history. They’ve lost in the first round each of the last three seasons, tying the league record. They’re the ninth team in history to drop three straight. "This one’s the most disappointing in the whole time I’ve been here," center Kyle Cook said. "Obviously with this group, we thought we’d go really far." They hit another dead end in the second half, when the Chargers sacked Dalton three times. The third-year quarterback fumbled and threw a pair of interceptions, leaving him with one touchdown and six interceptions in his three playoff losses. "When things don’t go right, the quarterback is going to get the blame," Dalton said. "I’m willing to take every shot at me. You’ve got to have thick skin." RUN WITH IT: The Chargers have won five straight by running the ball. They had a season-high 196 yards on the ground Sunday, including Ronnie Brown’s clinching 58-yard touchdown run in the fourth quarter. Rivers threw the ball less than he had all season, completing 12 of 16 for 128 yards and a touchdown. The Chargers have run for at least 144 yards in each of the last five games. 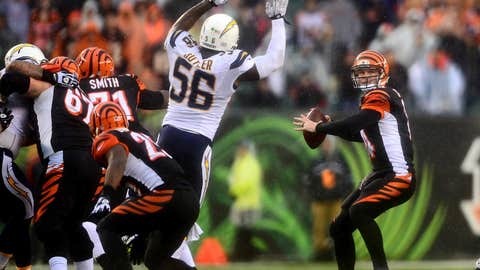 "The way our defense was playing, as long as we didn’t have a disaster and we made plays when they were there, we were going to win this game," Rivers said. ROAD WIN: The Chargers hadn’t won a playoff game on the road in an open-air stadium since the 1994 season, when they won the AFC title in Pittsburgh, 17-13. They got a bit of a break on the weather — in the 40s with rain in the second half, but not too bad. Certainly not like the the time they came to Cincinnati for a playoff game — the "Freezer Bowl" with a minus-59 wind chill on Jan. 10, 1982. The Bengals won that one 27-7. SIXTH SEEDS: Combined with New Orleans’ win in Philadelphia on Saturday night, the two No. 6 seeds both won for the first time since 2010, when Green Bay went on to the Super Bowl title. The Chargers to back to a place where they won only a few weeks ago, giving them some confidence. ALL ABOUT DALTON: The third-year quarterback has completed 57 percent of his passes in three playoff games for 718 yards with one touchdown, six interceptions, one fumble, nine sacks and a way-below-average 56.2 passer rating. With the pressure on Sunday, he unraveled in the second half. Rookie Giovani Bernard also fumbled at the San Diego 3-yard line after a catch. WHAT NOW? Coach Marvin Lewis slipped to 0-5 in the playoffs during his 11 seasons with Cincinnati. He’s expected to keep his job and get another chance under patient owner Mike Brown. Dalton set club records for touchdown passes and yards in a season, but has played poorly in the games that matter most. 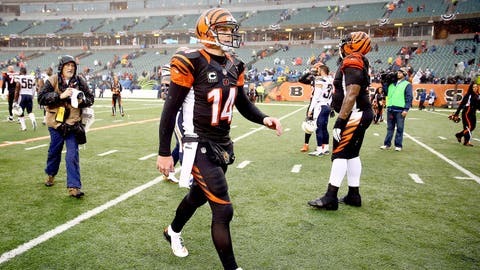 Do the Bengals start to question Dalton’s role long-term? "I don’t have any questions about Andy’s role in this thing," Lewis said. "We just have to keep working it. We’ve got to make sure we’re doing everything to help Andy all the time. He’s going to be very disappointed in himself today, obviously."